Taylor, Mrs. (Ann Martin), 1757-1830. My Mother. The illustrations to Little Red Riding-Hood are after cuts by Bewick. "Penny books printed and sold by J. Kendrew, Colliergate, York"--p.  of cover. First and last pages glued to wrapper. Date range taken from Davis, R. Kendrew of York and his chapbooks for children p. 41. First sentence: "There lived in a certain village a little girl, who was the prettiest creature that ever was seen, loved and admired by all who knew her." 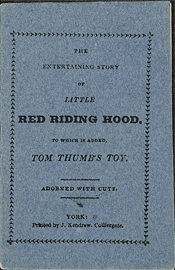 Contents: Entertaining story of Little Red Riding Hood -- Little Tom Thumb's toy -- My mother.